For the past three years, I’ve been running a series called “My Must-Have Mac Apps” that, once a year, would list the apps that I found indispensable on my Mac. This year, considering the changes that I went through from a workflow perspective, I thought it would be appropriate to start focusing on iOS as well. The first installment was about the iPad; today, I’m going to talk about the Mac. As I wrote when Mavericks was released, I don’t need my Mac as much as I used to. I can do most of my work from iOS (particularly from my iPad mini), but that doesn’t mean that I don’t need a Mac for some tasks or that I’ve stopped using it altogether. I still have to use a few OS X-only apps and tools to get work done – stuff that wouldn’t be possible on an iPad, no matter how hard I try. I may not be covering new Mac app releases on a weekly basis anymore, but, honestly, 2013 has been the year of iOS 7, with thousands of third-party developers shifting their focus to Apple’s mobile platform in order to update and redesign their apps in time for September. And the fact that Mavericks didn’t bring a radical new design or groundbreaking user features didn’t help either, as developers of Mac apps chose to release updates that focused on under-the-hood improvements and general optimizations. And yet, in spite of a new design direction and several changes to built-in apps, iOS 7 still doesn’t come with valid alternatives to the stuff OS X is great at: a filesystem with easy management of files that can be opened by multiple apps, precision editing with a cursor, command line utilities, system-wide automation tools, and more. For as much as the iOS ecosystem is maturing and changing at an incredible pace, I haven’t stopped using my Mac and there are some things that can only be done on OS X. And therefore, like every year, I have put together a list of the apps that I consider my must-haves – apps that I install every time I set up my Mac and that I use regularly. This year, I’ve simplified the list and gotten rid of extra layers for apps that I’m no longer using. You can compare the 2013 list to last year’s one and follow links from there to go back to previous years. You also won’t find last year’s section for price and Mac App Store stats at the bottom: developers often make price changes and release new versions of their apps outside the Mac App Store, so, ultimately, those stats couldn’t be properly contextualized over time. The list below is organized in four sections: Main, for apps that I use several times every day; Writing, for tools that I employ to research and craft articles for MacStories; and Image & Video Editing, listing apps that allow me to put together screencasts, GIFs, and images for the site. Each app is listed with its App Store/website link and, at the end of the article, you’ll find my Mac app of the year. Last night, Apple published its annual "Best of iTunes" list, which includes editorial picks for the best releases in music, movies, TV shows, apps, books, and podcasts of 2013. The special page, featured across the entire iTunes Store, can be viewed here. For apps, as in previous years Apple has picked apps and games of the year, runner-ups, and other notable app releases of the year. The App Store category is organized in iPhone, iPad, and Mac apps; this year, Apple has included sub-sections as "Trends", listing apps belonging to popular categories such as photo editing, productivity, and multiplayer games. On iOS, Apple has picked Duolingo and Ridiculous Fishing as app and game of the year for iPhone, and Disney Animated and BADLAND on the iPad. For the Mac, Apple has chosen Wunderlist and XCOM: Enemy Unknown as app and game of the year; on the Mac App Store, Apple hasn't included Trends, opting for a simpler "best apps" and "best games" organization. Last year, Apple picked Day One and Deus Ex: Human Revolution as winners for the Mac; Paper and The Room for the iPad; and Action Movie FX and Rayman Jungle Run for the iPhone. We have compiled the full list of apps below. For the past three years, I’ve been running a series called “My Must-Have Mac Apps” that, once a year, would list the apps that I found indispensable on my Mac. This year, considering the changes that I went through from a workflow perspective, I thought it would be appropriate to start focusing on iOS as well. I’d like to start with the iPad. I’ve been working primarily from my iPad for the past 15 months. For a variety of personal reasons that I’ve discussed before, I found myself unable to work from my Mac every day, so I decided to try and see whether the iPad and iOS could be viable OS X replacements -- not just companions. I ended up enjoying the iPad as a work device and, eventually, as a primary device powered by terrific apps that allow me to be more efficient on iOS. From a high-level, conceptual standpoint, this isn’t a new topic for MacStories readers or listeners of The Prompt. In the end, though, it all comes down to the apps – the software that I use on my iPad for work and play, for productivity and entertainment. Hence, “My Must-Have iPad Apps”. I consider this the first installment, even though it technically isn’t: I published similar articles in 2010 and 2011, but I skipped 2012 – the year when I really got serious about working from the iPad. This year’s installment is a reboot of the iPad series, which I’m going to publish regularly from now on; if you want, you can check back on the old articles linked above to see if there are apps that I’ve been using for three years (spoiler: yes). In terms of new product categories, specifically, if you look at the skills that Apple has from hardware, software, and services, and an incredible app ecosystem, these set of things is very, very unique, I think no one has a set of skills like this, and we obviously believe that we can use our skills in building other great products that are in categories that represent areas where we do not participate today. So we’re pretty confident about that. 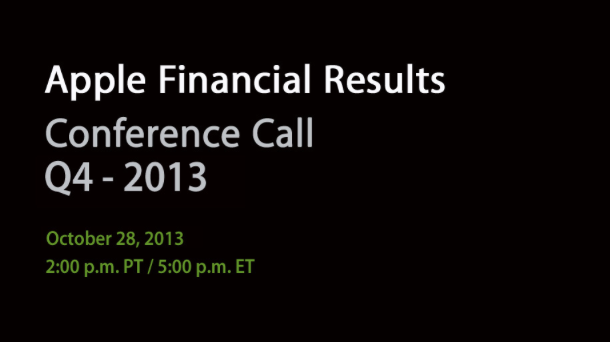 Apple has published their Q4 2013 financial results for the quarter that ended on September 28, 2013. The company posted revenue of $37.5 billion. The company sold 14.1 million iPads, 33.8 million iPhones, and 4.6 million Macs, earning a quarterly net profit of $7.5 billion. We’re pleased to report a strong finish to an amazing year with record fourth quarter revenue, including sales of almost 34 million iPhones,” said Tim Cook, Apple’s CEO. "We’re excited to go into the holidays with our new iPhone 5c and iPhone 5s, iOS 7, the new iPad mini with Retina Display and the incredibly thin and light iPad Air, new MacBook Pros, the radical new Mac Pro, OS X Mavericks and the next generation iWork and iLife apps for OS X and iOS.